Atlassian Corporation announced changes to JIRA. Effective December 2018, the basic authentication method that uses passwords and cookie-based authentication to access their APIs, is deprecated. Update existing authentication as quickly as possible. Use the email and API key method when creating your authentication. Go to https://id.atlassian.com/manage-profile/email and note your email address. Users with basic authentication should replace the user name value with the email address. Click Security then click Create or manage API tokens (or you can go directly to the link https://id.atlassian.com/manage/api-tokens). Next, click Create API token. In the pane that appears, enter a name for your API Token and click Create. Then on the next pane, click View to see your new API keys. You can now see your API key, copy it, and use it to authenticate Treasure Data console to your Jira server. Go to Integration Hub -> Catalog and click on the JIRA tile. Go back to Integrations Hub > Authentications then select your created authentication and click New Source. Enter a valid JQL in the New Source pop up then click Next. In the Transfer to tab, enter the database name and table name that you want to insert the data into. If you are creating a new database, select Create new database and give your database a name. 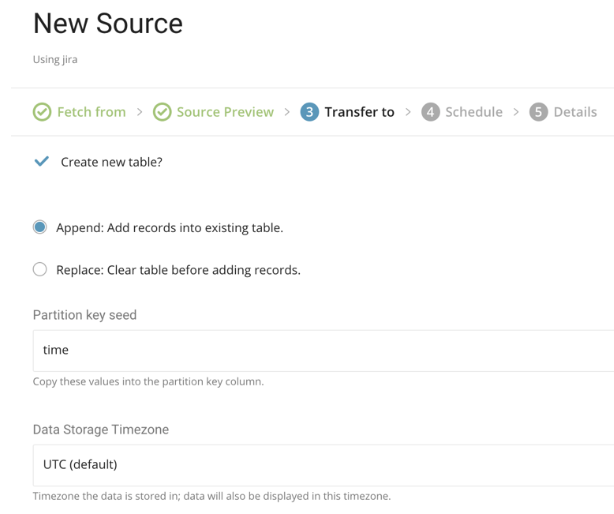 Complete the same steps for Create new table. 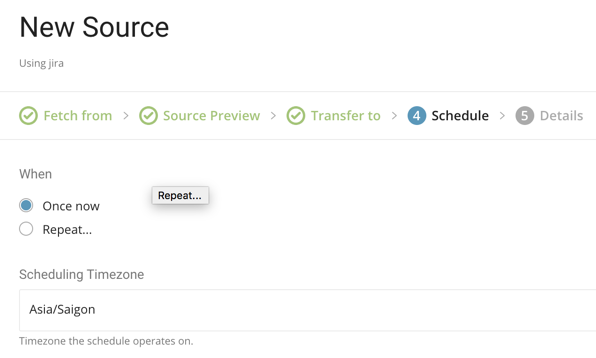 In the Schedule tab, you can specify a one-time transfer, or you can schedule an automated recurring transfer. Click Next. You can, optionally, rename the source. Then click Done, your job is scheduled. And you will be notified whenever it is done. The Data Connector for JIRA imports all tickets that match with the specified JQL. Use connector:guess. This command automatically reads the target data, and intelligently guesses the data format. If the system detects your column name or type unexpectedly, modify load.yml directly and preview again. You can schedule periodic Data Connector execution for periodic JIRA import. We take great care in distributing and operating our scheduler in order to achieve high availability. By using this feature, you no longer need a cron daemon on your local data center. 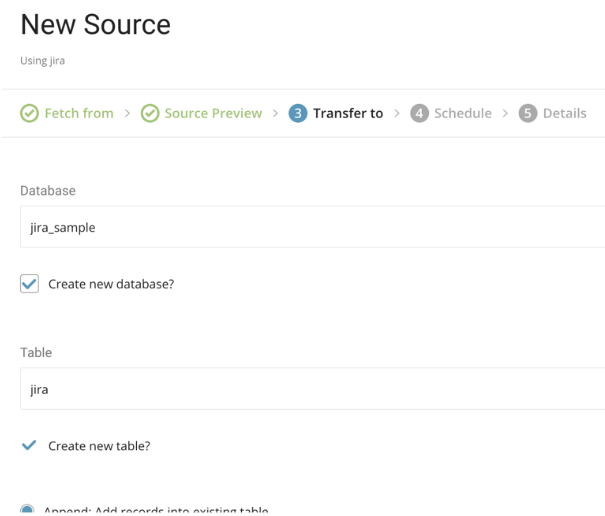 For the scheduled import, Data Connector for JIRA imports all files that match the specified JQL. By default, schedule is setup in UTC timezone. You can set the schedule in a timezone using -t or --timezone option. The `--timezone` option supports only extended timezone formats like 'Asia/Tokyo', 'America/Los_Angeles' etc. Timezone abbreviations like PST, CST are *not* supported and can lead to unexpected schedules.